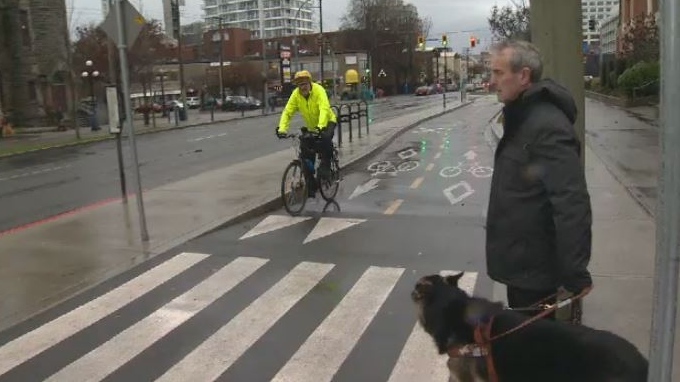 As a cyclist pedaled right through the cross walk, Graeme McCreath and his guide dog hovered apprehensively at the edge. Then a second cyclist also rode through without even slowing down. After a few minutes McCreath turned around. "Did the bike go through?" he asked. He couldn’t even be certain there had been a bicycle there. 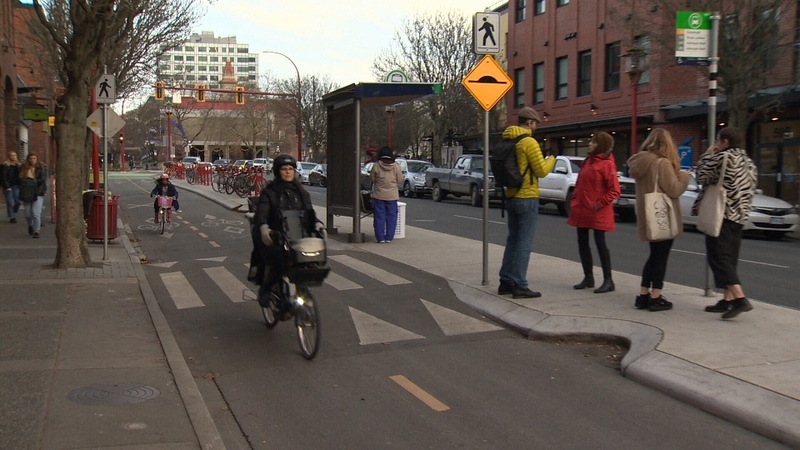 The design of Victoria's bike lanes is so dangerous, according to the Canadian Federation of the Blind, that the organization has filed a human rights complaint. The City of Victoria has recently asked the BC Human Rights Tribunal to dismiss the complaint, a source told CTV News. That isn’t sitting well with the University of Victoria’s Dean of Law, who is a human rights expert. "I’m not the judge, I’m not privy to all of the facts, but at the very least it should go to a full hearing to decide whether or not blind people who are getting off buses, crossing streets are in any danger, as a result of the traffic accommodations that have been done in Victoria," said Susan Breau. She explained that human rights go back to basic human dignity, and no one should be pushed aside. "Each one of us can become disabled in our lifetime, it has happened to me, it has happened to many people. I’m disabled as a result of arthritis. We would all want to be treated with basic dignity but also with basic safety in mind," said Breau. She thinks the case is about more than accommodation. 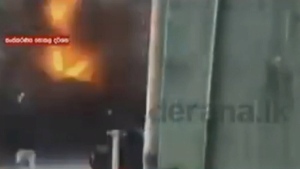 "This is a question of these people's safety. I believe that Victoria has a real opportunity here, given the aging population to be a model city, that treats all of their citizens properly and I believe that the right thing can be done in this case," she said. The man named in the complaint said the right thing is tearing out the bus stops, and rebuilding, so the buses can once again pull up to the sidewalk curb. “They’ve created a terrible problem and they just don’t want to deal with it,” said Oriano Belusic. The City of Victoria has declined to discuss the complaint as long as it is before the BCHRT, and it could be months before there is a decision as to whether it should be dismissed or go to a full hearing. In the meantime, McCreath is avoiding all bus routes where the bus stops are on the other side of a bike lane. He said creating a safer environment for cyclists shouldn’t come at the expense of someone else’s safety.